Access to clean water is an essential component of a healthy community. From our first community involvement over twenty years ago, Shoulder to Shoulder has been active in providing clean drinking water and education to rural Honduras. Nuestro suministro local de agua proviene de manantiales de las montañas circundantes limpias nuestras comunidades. Para cuando el agua llegue a las comunidades, sin embargo, más de la mitad de ella se ha perdido debido a la mala infraestructura. Esto permite que el agua de superficie contaminada y virus bacterianos para entrar en el suministro. Beginning in 1994, Shoulder to Shoulder developed slow sand filters using local products and fabrication. 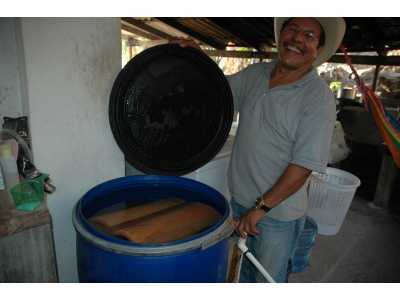 Many of these filters are still in place, including at our clinic sites. In recent years, with the assistance of Rotary Club International, we have purchased over 1,000 Potters for Peace clay filters. 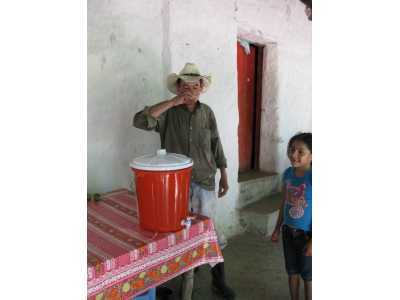 These filters produce clean, drinkable water that provide a family’s daily drinking and cooking needs for two years. The local government also plays a role in maintaining local water and sanitation systems. In 2012, we partnered with a group of local Intibucá mayors to conduct a pilot water project in the community of Agua Zarca. Using our data resources as a base, Hombro a Hombro provided the filters and the information needed to target the neediest recipients, and the government assisted us with distribution and maintenance labor for 70 filters and the construction of several new latrines. Each recipient contributed a small amount toward their filter. Their contributions are held by the local water board to fund replacement and maintenance. We regularly monitor the water quality and the health of the community as we attempt to dramatically reduce water-borne diseases. Drinking contaminated water results in enormous health implications, especially for the most vulnerable members of our population – children, the elderly, and the sick. Diarrhea remains the number one cause of death in children between ages 2 and 5, which can be largely avoided by using clean water for drinking and cooking in the homes. Clean water not only prevents children’s deaths but also prevents prolonged and repeated sicknesses, which deprive them of physical and mental development in a crucial age of their development. We are scaling up the clean water project, with the goal of providing every family in need with clean water. 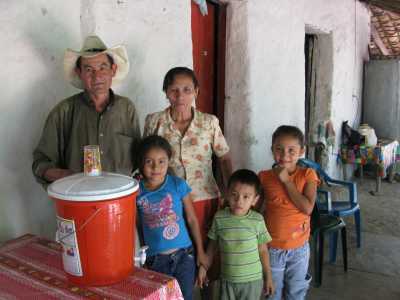 A $45 donation buys clean drinking water for a family for two years.